Culms: Erect, slender, wiry, glabrous. Blades: Basal and cauline; blades 8 to 16 inches long, .2 inch wide, filiform to involute to folded, tip tapering, glabrous, scabrous margins and midrib. Sheaths: Longer than internodes, terete, throat somewhat pilose, summit with conspicuous tufts of hair. 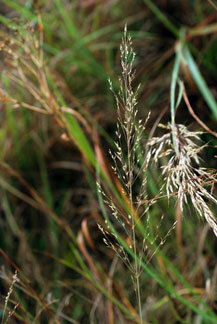 Inflorescences: Panicle, open, elliptical to narrowly pyramidal, 4.5 to 8 inches long, up to 2.8 inches wide, branches ascending, 1.2 to 2.4 inches long, spikelets borne toward branch tips on short pedicels. Spikelets: Grayish, 1-flowered, .16 to .28 inch long, awnless; glumes glabrous, first glume subulate, .07 to .18 inch long, second glume lanceolate, .1 to .24 inch long, acuminate or awn-pointed; lemmas .13 to .16 inch, obtuse or acute, 1-veined, glabrous; paleas as along as or slightly longer than lemmas. Habitat: Prairies, roadsides, woodland edges; sandy to clay loam soils. Forage Value: Good forage value for livestock prior to maturity. Uses: The Ojibwa applied a poultice of crushed root to sores. Comments: Densely tufted. Occasionally planted as an ornamental.